Yet, living a fantastic life and running rewarding and profitable business can go hand in hand. That's what the Freedom Plan book reveals. Start reading The Freedom Plan on your Kindle in under a minute. 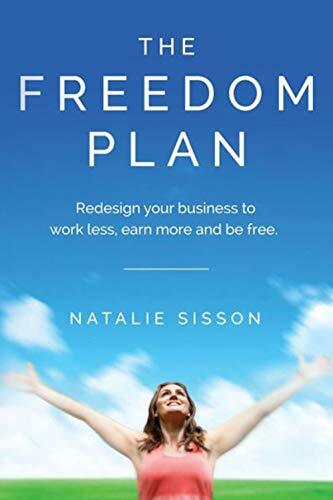 Natalie Sisson's new book, The Freedom Plan, really takes entrepreneurship to the next level. In her first book, The Suitcase Entrepreneur, Natalie showed how to leave the 9 to 5 grind behind while building a location independent business - and life - that will allow you to truly have it all. The Freedom Plan is the next evolution - a sure-fire guide telling you how to keep that business going while at the same time reducing your role in it, via a curated mix of systems and strategies that Natalie herself has used to great success. You'll find lots of actionable advice and information here that will help you take your entrepreneur business to the next level, where the goal is even more freedom in life and business. 5.0 out of 5 starsGreat tips for the Entrepreneur! Natalie's book has so many tried and true tips for today's Entrepreneur. I've been a fan of her work since The Suitcase Entrepreneur and love the direction she's gone with freedom planning (something we all need more of in our lives). I'm definitely keeping this book around as a guide and am already putting the great tips she shares into action! Highly recommended read. I love this author's books! One of the appeals of entrepreneurship is getting to apply your own priorities, goals, and work styles. Too often, however, we entrepreneurs end up working 100 hour weeks and becoming slaves to our businesses. “The Freedom Plan” reminds us all that business is supposed to work for people, not the other way around. Perhaps if we build businesses that embrace what it means to be human (the ups and downs, family, friends, well-being, …), we and our employees might be happier and healthier. Let’s make the world a better place by making the work place better for humans. You’ll finish this book feeling inspired and ready to leverage a new set of business tools to boost your revenue lines while freeing up more time to spend with the people you love, doing the things you enjoy. 5.0 out of 5 starsGreat book with lots of actionable advice! Natalie's latest book "The Freedom Plan" is an excellent resource for those who want to create a lifestyle business that will bring time, financial and location freedom. Unlike some other books that are "fluff", Natalie's book gives you real, actionable advice that comes from her wealth of personal experience. Her chapter on creating and designing your perfect day is pure gold and will completely change the way you look at life, period! I also love the many real-life case studies she shares in her book of people who are living life on their own terms while creating a business they love...super inspirational, and gave me lots of ideas. If you're still on the fence, get her book - you won't be disappointed! 5.0 out of 5 starsThe Freedom Plan will help you design and implement your own personalized action plan. Natalie's book reflects the energy and practical advice that underpins what she has achieved for herself. Natalie is the real deal! The book focuses on having the right mindset, skills and tools to create a personal plan that provides the freedom that you want, in your own way. Plus it's also about making an impact on the world. Having already put her advice to work, I am achieving better and quicker results as I work towards achieving my freedom goals. If you want to create a life that reflects your own version of freedom, buy this book.